At Castle Manor we value the opinions of our students and are dedicated to giving them a voice in our community. Our Student Parliament is integral to this value, giving students the chance to raise issues and be heard on matters that are important to them. Our Student Parliament is made up of representatives from each tutor group and a Student Leadership Team. 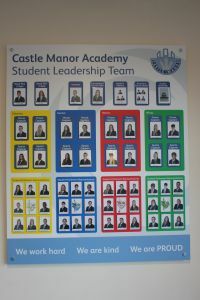 The Student Leadership Team are responsible for running all Student Parliament meetings and collating points of discussion from the student body. They also work closely with staff to ensure agenda items are dealt with. The Student Parliament is also supported by our House Captains and Head Boy and Girl; many of whom fulfill our Student Leadership roles. Our Head Boy and Head Girl are elected every year by our students after a week of campaigning culminating in a whole school vote.